pluk pluk pluk. Yes… chickened out and decided not to attempt passage through Woolhampton. There was a hireboat moored in front of us this morning and I stopped to have a chat. 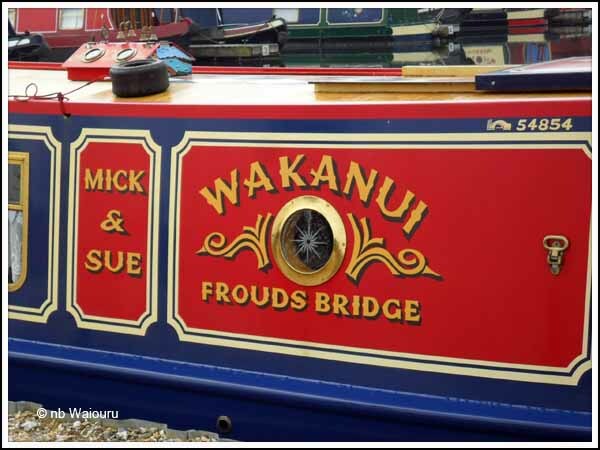 It was their first time on a narrowboat and they had only spent two hours steering it. Their plan was to go through Woolhampton. Should we do the the same? In the end I decided they had two powerful reasons for attempting the passage. 1. As total novices they didn’t understand what they were going to experience. 2. It wasn’t their boat should they damage it in the attempt. We’ve decided to wait another week. Maybe age is making me more risk averse! 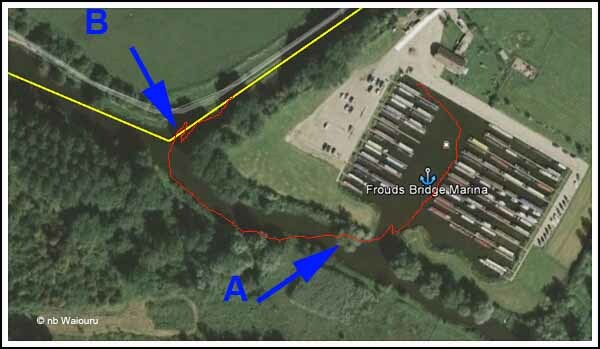 However we still needed to empty the toilet tank which meant a trip to Frouds Bridge Marina. Waiouru happily moved down the the junction at tick-over (800rpm). But when I pushed the bow out into the river the current caught her and we picked up speed. with the speed of the current I knew there would only be one chance to get into the marina entrance. If we missed it then we’d be taken down to the weir. Obviously we managed to make the turn but not without having to use a considerable amount of throttle to force Waiouru’s stern against the current. 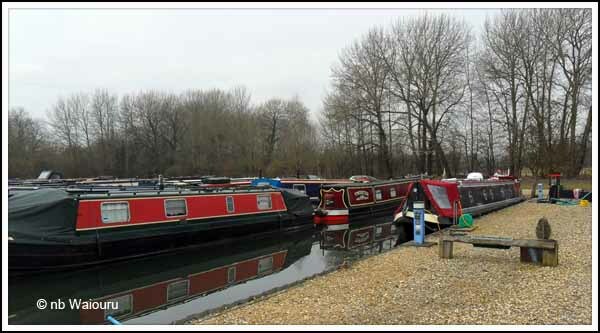 Once inside the marina we could drop back to tick-over and then I carefully reversed back down onto the pump-out mooring. I didn’t even have to use the “girlie button”! Mick, the manager came out and did the pump-out for us. Whilst moored we took the opportunity to top up the water tank. Mick and Sue have their boat moored right in front of their house. The return journey wasn’t done nearly as well. 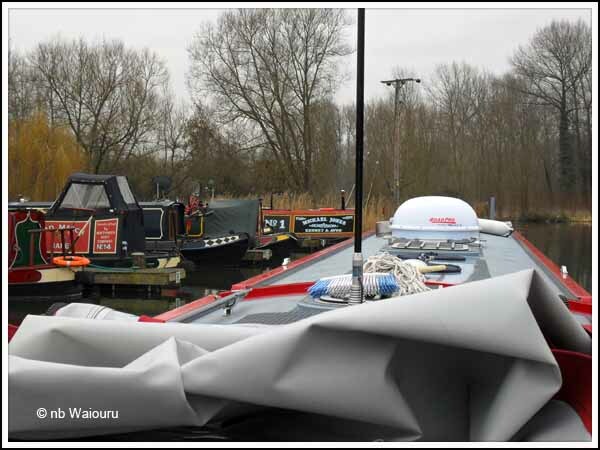 Everything started OK with us carefully manoeuvring off the facilities mooring and out the left side of the channel. 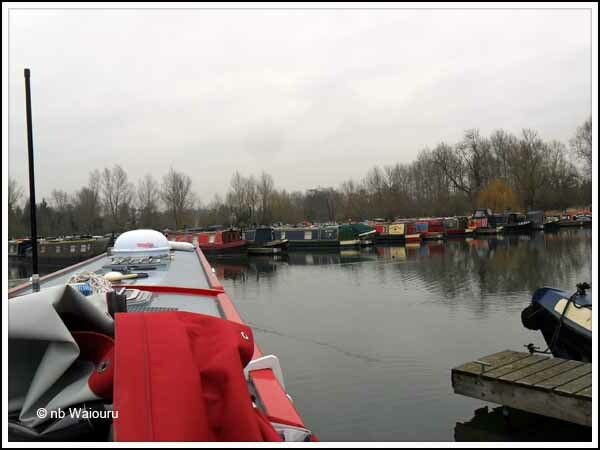 Mick had informed us to keep to the left (port) and on approaching the entrance aim for the starboard (right) bank which would avoid the current pushing the bow across the flow. What actually happened looks something like the red trace in the following screen dump. The current caught the bow harder than I had anticipated (point A) and full rev’s were required to get the stern out into the middle of the river. We actually ended up parallel to (and very close to) the left bank. Then I completely mucked up the turn back onto the canal (point B). I’d stupidly anticipated the current would push the bow around to starboard (right). But there was no flow at this point. The current simply stopped the stern from swinging to port. I couldn’t get the bow around sufficiently to complete the turn in one movement. We had to reverse and take a second bite at it. In my defence I should point out the Morse control handle (the combination accelerator & forward/reverse control) had worked loose and at one stage fallen off in my hand. The boater ahead was going to Woolhampton whilst we turn right where he is to get back onto the canal. A little further along the canal a couple on bicycles caught up with us and called out that the boat looked nice and they liked the name…….. More bloody Kiwi’s…… Can’t get away from them! So at the end of our second day of cruising we find ourselves back down the canal approximately 10 yards from where we started! After mooring I put on the glasses and had a good look at the Morse controller. The problem was a loose grub screw which was easily tightened with an Allen key. Now all I have to do is work out was the infrequent rattle is from the stern. It’s down low, almost as if it’s under the stern of the boat. I’ve been into the garden shed and the bolts between the gearbox, python drive and drive shaft all appear to be tight. Tomorrow I’ll check the weed hatch to see if anything is loose down there. The move towards Newbury has been delayed a week whilst we wait for the water to calm. At least we’re not in a hurry! Infrequent rattle at the stern, down below could = prop cavitation. I know the Axiom's design is to minimise the chances of this, but don't discount it altogether if you can't see any other reason. Thanks Peter.... Another thing to research! 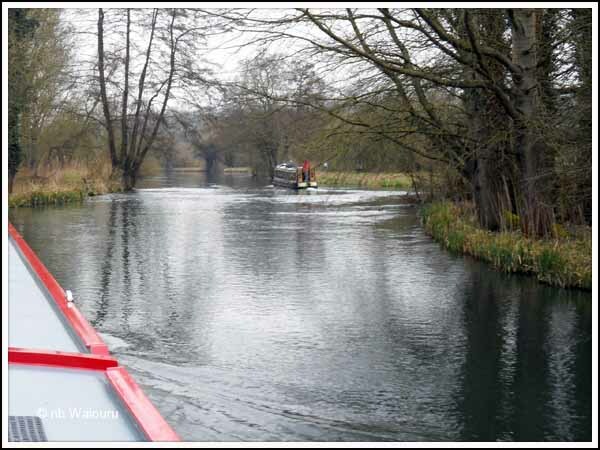 We got tbhat regularly and for the first couple of months my hand went down the weed hatch until our confidence grew that it was cavitation as a result of a low stern and shallow canal.